"Teams don't get any better than this." "Never regret the things that you have done; only regret the things that you have never tried"
"There is no such thing as a problem without a gift for you in its hands". Moved by the events she lived through with her friend Dan, Mary Pat Avery wrote the screenplay called Airmoves, which was later changed to Above All Else. Mary Pat started writing the book, and in 2009, Dan decided to use this material in a team-building book he was writing separately. The result was a book they decided to call the same as their screenplay: Above All Else. In 1992, Dan Brodsky-Chenfeld survived a plane crash which killed sixteen of the twenty-two people on board. He was left critically injured and woke up from a six-week-long coma with a broken neck, broken skull, severe head trauma, a collapsed lung, and other serious internal injuries. 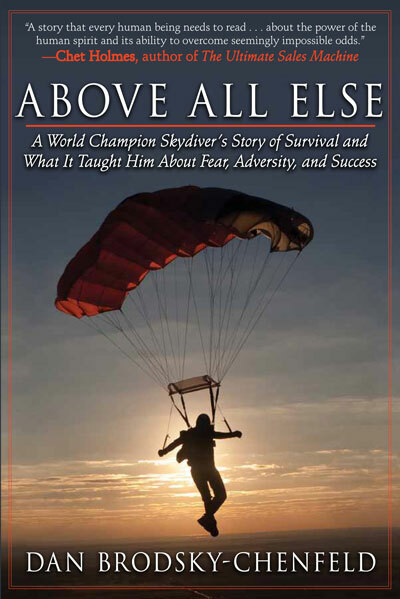 Against all odds, Dan recovered and went on to become a multi-time world champion skydiver. In Above All Else (ghost/co-written by Mary Pat Avery), Dan tells an inspiring story of hopes, dreams, and his amazing comeback. Dan's extraordinary talent for bringing out the best in others has made him one of the most influential people in the sport of skydiving and one of the most sought after coaches in the world. His strategies have led him to victories as a coach, competitor, husband, father and business owner. Whatever your goals are, Dan Brodsky-Chenfeld can help you make them a reality. Video: Dan B.C. 's segment on Skydive TV. Video courtesy of Skydive TV. "Up in the air, but down to earth"
"Did you know...that Dan BC's unique skydiving story comes in a book and a movie?" © 2010-2019 Airmoves Entertainment, All Rights Reserved.